As we move into spring, there are a number of home-related topics that come to mind. I happen to live in a secure loft complex for artists and creative people; it’s surprisingly high-tech and I take the security for granted. We know if there’s a high level of carbon monoxide detected somewhere, our entries are secure, there is lighting control for emergency situations, and other facets I’m sure I don’t even know about. I’m security-spoiled without even having to try. If I do ever decide to buy a home, I’d certainly take into consideration the technology we have at our disposal in this day and age and see how it would fit into my new home, considering that my security expectations have been set fairly high. With this in mind, I was able to ask Jill Lloyd of Lloyd Security about what’s out there in residential and commercial security. What is the history of Lloyd Security? Jill Lloyd: Lloyd Security was started 13 years ago after a little piece of advice that my dad gave me when I was feeling frustrated with the company I was working for. He said you can only be as good as the company you work for, and that gave me the idea of starting my own company so that I could deliver the level of service and the type of product that I felt my clients wanted. It was a great decision; definitely was not easy but in the long run it’s been a really great decision. 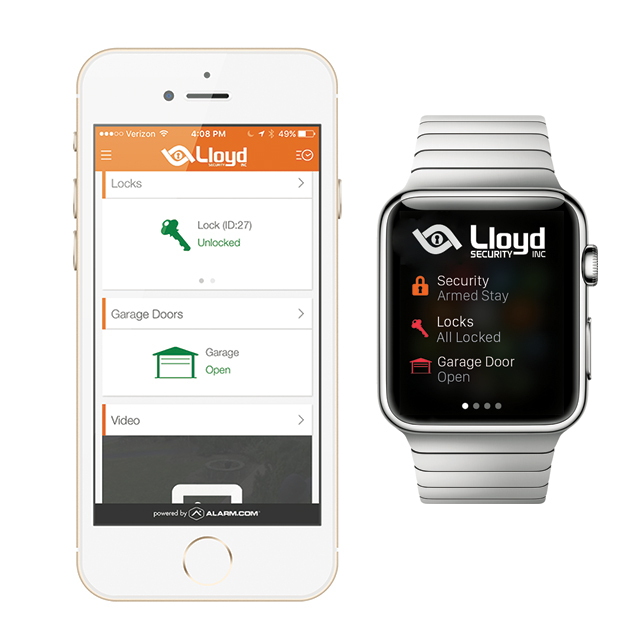 What services and products does Lloyd Security offer? JL: We offer electronic technology solutions to help people live more and worry less. We provide electronic solutions for both homes and businesses so when you’re home we can do a basic burglar alarm or an environmental monitoring system with fire, carbon monoxide free sensors, and flood sensors, but we can also move into a Smart Home and by using our mobile technology we’re able to help people control their home, their thermostats, their lights, their locks, view video, and also remotely arm and disarm the system. Video verification allow us access when notified of an event at a property to remote into the property and view video live, so that we can validate human activity and dispatch accordingly. We offer the same for commercial, but for commercial we can do a fully integrated system, including a video platform, access control, and security. We also offer design, monitoring, and service, so we provide end-to-end solutions for both homes and businesses. What sorts of dwellings can security systems be installed in? JL: Residential, existing homes, new construction, multi-unit dwellings, condominiums, apartments, jobsite security, commercial construction, and commercial buildings. Are these available to people inquiring for their homes or do people need to work with builders? JL: It doesn’t matter. We can retrofit an existing home or work with the end user’s builder. It’s simply a matter of what’s most convenient for our clients. It looks like homeowners can monitor their security system via an app. Can you tell us more about this?JL: Yes. Our technology allows people to remotely manage their home by integrating their security system, thermostat control, lighting control, locks, and even video. So, through our app, a client would be able to arm and disarm their system, check the status of the system, see the history of who’s armed it and disarmed it and at what time, they can also turn the thermostat up or down or change the season of it while managing the efficiency of their home. They can lock and unlock their doors, open and close their garage overhead doors, and they also can put lights on a program that varies based on the time of year and adjust to the seasonality. It’s a great feature, it’s very affordable, very easy to use. It’s something that is becoming more expected and has become more of a need than a want. How about managing a vacation home or cabin? How does that work? I’d imagine that would be particularly useful for fire monitoring when the building might be vacant. JL: Yes, absolutely. We can monitor a building for fire 24/7/365. We also can manage a vacation home just like we manage a residence, so through a smart phone or computer you would have access to not only the security system but also the lights, locks, thermostat, and video. It’s a great way to keep an eye on a property that you aren’t living in and able to manage on a day-to-day basis. What sort of security needs to be taken into consideration for the springtime, after a cold winter in Minnesota? JL: Homeowners need to be mindful of when they are working on projects outside that they don’t leave their tools and their ladders unsecured overnight. The tools can actually be used as a way of entering the home easily and the ladder being left out is almost like a welcome mat that says, “Here’s an easy entry into my home.” If you have a ladder that you store on the side of your house make sure it’s locked up; otherwise try to keep everything in your garage. Make sure you turn back your bushes so that you don’t have a hiding place, install and confirm that you have motion detection lights that are working so that that can give you another layer of security, but also make sure you keep your doors locked. People are excited to be back outside in the spring, they tend to congregate in the back of the yard and leave the front door unlocked. So be mindful to always keep your doors locked, even when you’re just working in your yard. For more information about residential or commercial security and technology, visit www.lloydsecurity.com.